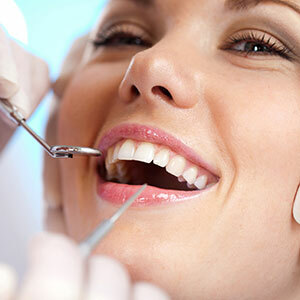 Regular dental visits are very important to your oral health, as well as to your overall health. You should meet with your dentist or hygienist every six months. A hygienist will scale your teeth and remove any debris, plaque or tartar build-up. She will then floss and polish your teeth and give you an optional fluoride treatment. At a child’s cleaning, they may also have sealants placed on their teeth. Sealants are a protective coat placed on teeth that can help prevent cavities from forming. Fluoride treatment can assist in keeping your teeth strong and preventing cavities. After meeting with the hygienist, the dentist will check your x-rays, address any problems you may be having, and plan any treatment that you will need. Periodontal disease is very common, but does not always have distinct symptoms. It is an inflammation or infection of the supporting structures of the teeth (gums, bone, ligaments and root surfaces) that will eventually result in the loss of teeth. You may notice that your gums bleed easily, that you have a bad taste in your mouth, that gums appear red or swollen, or that your teeth appear longer or have shifted. 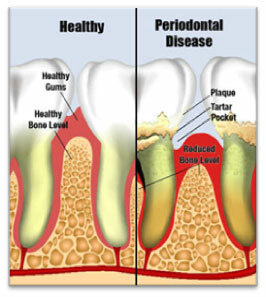 Three out of every four adults over the age of 35 are affected by periodontal disease. Smoking, diabetes, illness, poor oral hygiene, and some medications increase the likeliness of developing gum disease. This is one of the many reasons why regular checkups with your dentist are so important. Deep scaling and root planing is a procedure that removes bacteria, toxins, tartar and diseased deposits from the surfaces of roots just below the gumline. Usually done with a local anesthetic, this treatment can be highly effective in helping control gum disease. However, regular follow-up cleanings, called periodontal maintenance, and good home care are also very crucial in maintaining periodontal health. In some cases, scaling and root planing is not enough and a referral to a gum specialist, or periodontist, will be necessary.